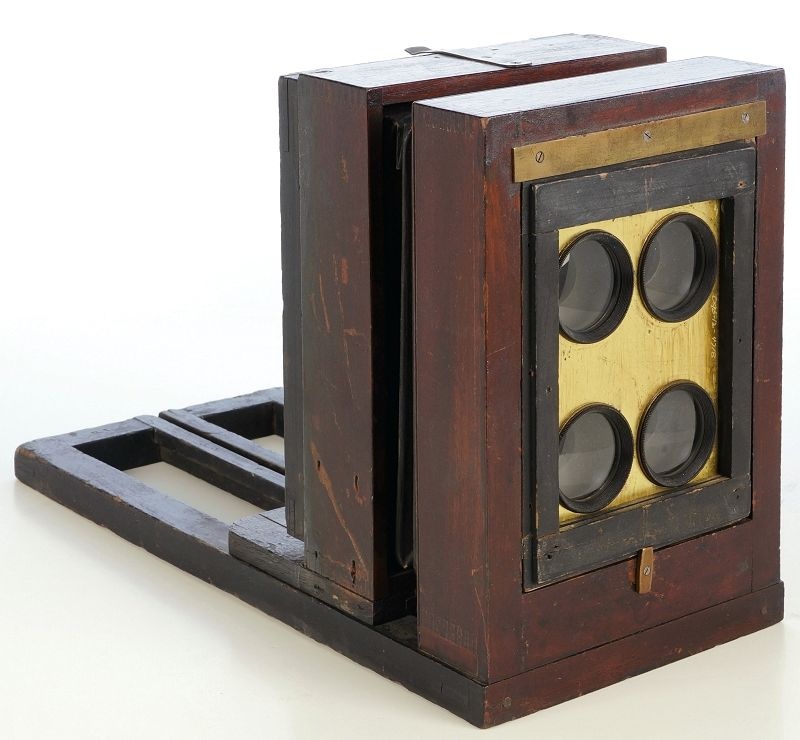 Introduced in the 1870s, the Scovill Ferrotype Bon-Ton View Box is a rare mahogany camera for making 4 tintypes on a 5x7 plate. Unlike the majority of multiple lens cameras, the Bon Ton View Box does not have a large multiplying back for making more than four "gem" images. This particular example includes the original wood septum and four S.M.Co. marked lenses. An identical camera appears in the 1870s E & H.T. Anthony catalog as a Climax Ferrotype No.41, selling for $45 and later in the 1888 W.D. Gatchel catalogue for $27.50. But for me, collecting takes on a deeper meaning than simply owning the camera and knowing the specifications. To understand a camera's history, manufacturer, owner, and other tantalizing tidbits adds depth and meaning to a collection. Before the camera arrived, I asked the seller about the provenance. Much to my surprise, the seller related a story of where the camera was found 40 years ago - in a "one-holer" outhouse in Etna, Maine! While waiting for the camera, I began to wonder if it acquired a new "personality" after unceremoniously residing in the most "privy" of all places. Within a week the camera arrived. As layers of bubble-wrap were carefully removed, brief glimpses of four lenses could be seen, then polished wood, then ... brown residue ... uh oh ... "sniff" ... the camera smelled. Yikes! Literally holding my breath, a tentative but not to close examination, allayed my fears. I gazed upon layers of collodion residue that dripped from who knows how many plateholders onto the rear standard. A great sign because I consider collodion stains a badge of honor that authenticates a camera's age. Another positive sign was the thicker, extended wood shelf beneath the ground glass, another indicator that the camera was built strictly for a "wet" process. And fortunately, it was the musty odor of 100+ years of accumulated dust I smelled. This camera was a "shooter," and in remarkable condition considering its origin. "Shooters" in good condition are noteworthy cameras, experienced workhorses earning their keep day in and day out. Looking at the "one holer" Scovill Ferrotype camera, its still easy to visualize the photographer going through a traditionally messy collodion ritual; mixing chemistry, patiently coating plates, quickly loading plateholders, taking pictures, and developing an image before the stuff could dry. Satisfied with the results, the itinerant photographer would move on and repeat the process - dripping more layers of collodion goo onto the camera. Unlike dry-plate cameras, the wetplate process exacts a toll on the apparatus. No matter how careful and nimble fingered a photographer was, collodion got on everything and, over time, would decay the wood. I now wonder about the scenes that might have softly illuminated the ground glass in 19th century Etna. Who used it? What did the camera see? And more importantly, how did it end up in an outhouse? 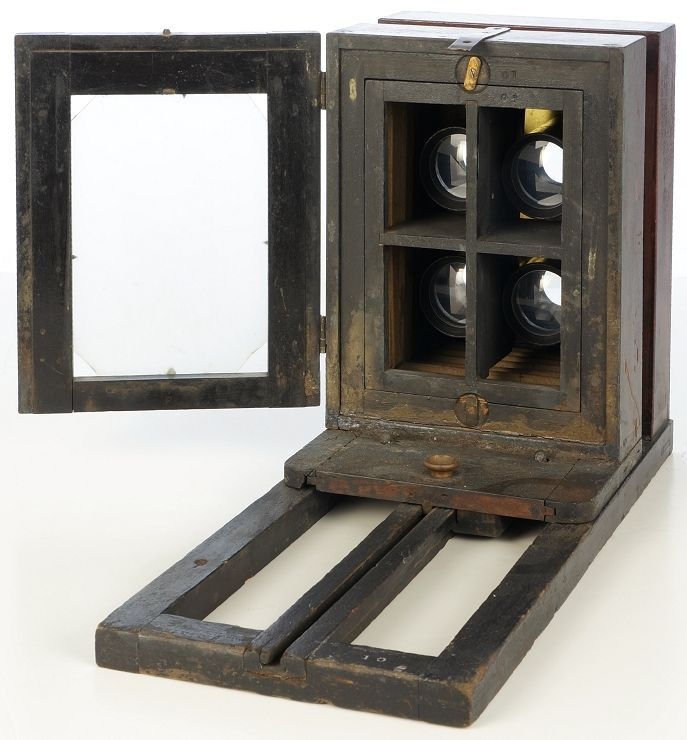 Note About Prices: This camera selling for $45 in the mid-1870s would be about $698 in year 2000 dollars. By 1888, the camera was discounted to $27.50, or about $521 in year 2000 currency.